So Irresistible they sell themselves! The Gourmet Caramel Corn Fundraising Program! Did you know that we Americans consume more than 17.3 billion quarts of popcorn each year? Every bite of our Gourmet Caramel Corn is crisp, flavorful, and fresh. Offer your supporters six fantastic flavors and watch your fundraising profits explode! This product is Kosher. Has a shelf Life of 120 days, No artificial additives, preservatives or fillers. Zero Trans Fat. FREE to Start: The Gourmet Caramel Corn fundraising program costs absolutely nothing to get started. Simply let us know how many fundraising participants you have and we’ll send 1 order-taker for each of them, at no charge. Free Shipping and No Minimums: Your group receives Free Shipping when you sell $1,000 retail or more of Gourmet Caramel Corn. It's easy - a small group of 20 participants has to sell only 4 units each to get free shipping. Temperature Warning - Is your weather hotter than 65F degrees? : This brochure contains chocolate items. We cannot deliver any chocolate items to you when it is 65F degrees or warmer. How Does the The Caramel Popcorn Fundraiser Work? 1. 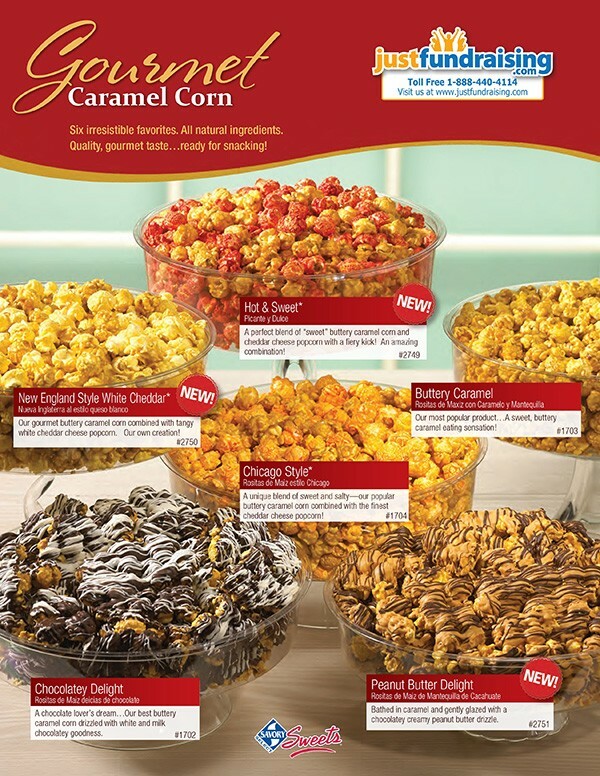 Order 1 The Caramel PopCorn order-taker PER fundraising participant – they’re FREE of charge! 2. 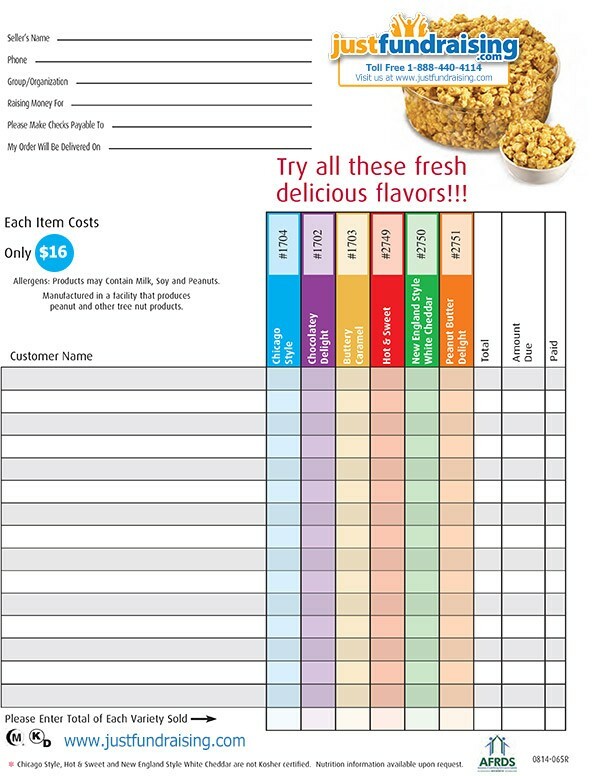 Have your group members show the order-taker to friends, family, neighbors, and or co-workers and invite them to purchase 1 or more cases of popcorn. (Note: Your participants will collect the funds up-front, and will take note of their supporter’s name and mailing address on the order form included). We are a non-profit organization raising funds to pay for equipment fees and tournament expenses!! Our family and friends love the popcorn tubs ($16) they literally ask for us to sell them!! Thanks for helping us! Our weightlifting program sold the popcorn for only a week and ended up raising over $1,000 profit for new equipment. Our softball team was raising money for tournaments and travel fees. We ended up making over $1,300 in profit with only 11 sellers participating! Our fundraiser went very well, we actually exceeded our sales goal. The writer's club at our school was raising money for a field trip to a museum and we ended up raising over $2,000! Our students brought the brochures home for thanksgiving and we also promoted the fundraiser on our school's facebook and twitter pages. Our dance studio was raising money for a new floor for the studio and we raised over $2,000! We sold even more than we did last year and went beyond our fundraising goal. Our fundraiser went better than expected! We are a small organization and we were raising money for our literacy program which brings a classroom to our building and helps pay for books. I was the only person selling and I raised over $1,000! We had a group of only 36 sellers. We raised over $4,000 in profit that will help pay for tournament fees for our Volleyball team. We will be going to Branson on a clogging performing tour this summer. This fundraiser helped us to get a great start on the payments. I will definitely do the Popcorn fundraiser again in the near future!! Customer Service was friendly and helpful. Thank you! The popcorn is absolutely delicious! We have been doing this fundraiser for the past 3 years and every year we have people calling us and begging for more! Customer service was very friendly and helpful every time I called. My issues were resolved to my satisfaction. I would be happy to work with JustFundraising again.